See, it's true! Must be all the carrots and squash Becca has been eating lately. HA! 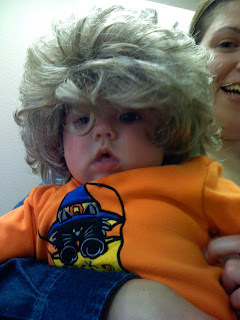 No really, it's just a wig I promise. 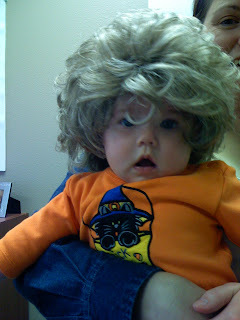 She was at my office trying on wigs the other day and we had to get a picture. But it is true that Becca is finally getting some real hair, thank goodness. She is also almost sitting up by herself and she's just about figured out how to roll over in the bed. She is getting to be such a big girl and we are having fun watching her. Grammy and Nanny are coming to visit this weekend, so we are looking forward to that. Plenty of pics to come later...good night. It's bedtime at the Bramells. Boy, she looks great with hair!! Ha! Hope ya'll have a fun weekend. Kiss Becca for me! Nanny and I will be there in about 24 hours......can't wait!!! See you all tomorrow!